In my last post we talked about why the astronauts appear to float in space even though there’s just as much gravity in space as there is on the ground. (Well technically, the effect of gravity is less the further from the Earth you get, but we’ll save that for another post.) The point is, they’re not floating because there isn’t gravity in space, they’re floating because they’re falling. And they’re not hitting the ground because they have achieved orbital velocity, meaning they’re travelling fast enough parallel to the ground beneath them that the Earth is actually curving away from them at the same rate they’re falling. Remember the cannonball that we shot so fast that it went all the way around the Earth and never came back down? 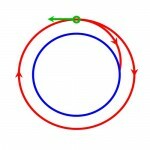 Remember that in order for us to get our cannonball into orbit, it required a certain velocity, and velocity means both ‘speed’ and ‘direction.’ If we speed up the cannonball in the opposite direction it’s travelling (that is to say, slow it down), then it will no longer be travelling at the speed required for it to stay in orbit and will eventual fall back down. So what the astronauts do when they leave the space station is they fire their rockets in the opposite direction they’re travelling (‘retro-fire’), enter the Earth’s atmosphere, then open their parachutes and land safely. A very important point I’d like to make here is that anything travelling at these velocities will follow the same path regardless of their weight. Galileo proved this 400 years ago, and the astronauts of the Apollo 15 mission showed it in action on the Moon by dropping a feather and a hammer at the same time. Both the feather and hammer hit the ground at exactly the same time. That is direct evidence that no matter what an objects mass is (how heavy it is), gravity will effect it the same. We can put a feather into orbit just like we can put a cannonball into the same orbit – they’ll both be going the same speed, the only difference is that one (the feather) will require less effort to get there. That’s why the astronauts appear to float inside the space station; the giant space station and the tiny astronaut inside it both fall at the same speed.